The Stephen McNeil Liberal government is convening the legislature on the evening of Monday, February 13th to ram through a bill imposing a collective agreement on the teachers. It is an act of both political cowardice and arrogance. Not previous known for militancy, the teachers voted not once, but three times (the third time by 78.5%) to reject a bargaining settlement negotiated by their union with the province. As in other instances of public service bargaining over the past decade, this is a revolt from below, from the members, spurring the union leadership on. 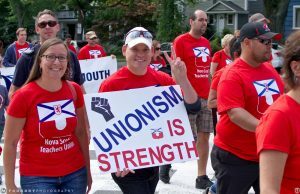 Teachers’ determination to achieve justice demands the support of the Nova Scotia trade union movement and, indeed, all of us. Other sets of public sector negotiations are pending and we draw inspiration from the example of the teachers. Teachers are justifiably furious for several reasons. • The conditions of teaching have become more difficult. Class size, class composition, and non-teaching duties have all changed, making greater demands on teachers. They spend more and more of their time accounting for teaching and less and less time actually teaching. Despite the scoldings of Premier McNeil and Education Minister Karen Casey, teachers point to arbitrary orders from above and changes without consultation. • The government, faced with a legal dilemma, has introduced a desperate raft of legislation that is unconstitutional. The Supreme Court of Canada has given Charter protection to the right to bargain collectively and the right to strike. Governments can remove the right to strike ONLY if they substitute binding, unfettered third-party arbitration. But the government wants neither a strike nor arbitration. So it has served an illegal ultimatum on the teachers. And the teachers are pushing back. • As the saying goes: Teachers’ working conditions are our children’s learning conditions. For years now, governments in Nova Scotia, Canada and North America have been disparaging teachers and other valuable public workers in order to lower taxes to the wealthy and devalue public programs for the rest of us. Is this austerity necessary? Behind the rhetoric lie the facts: In the past thirty years, Nova Scotia has become over 65% richer in GDP per capita. We should have more money, not less, to pay workers decently and provide good public services and programs. But over the same period, the median real wages of Nova Scotia workers have fallen, and especially those of the lower-paid. And government programs have been cut. Where did the money go? Quite simply, it has gone to the owners of capital, both inside and outside the province. Having presided over the impoverishment of most workers, the government is now turning on those groups that have managed to (barely) hold their own in compensation – credentialed workers who are unionized, such as teachers, nurses and technologists. The Public Services Sustainability Act (Bill 148) essentially eliminates collective bargaining by legislatively imposing a pay package on workers. This legislation will likely eventually be overturned by the courts, but in the meantime it and similar labour legislation holds a club over the head of the unions and their members. While the courts can be one venue for contestation, labour law is made in the streets. Only by defying the bully tactics of the government, can teachers and other public sector workers effect real change. Public-sector labour disputes are a battle for public support as, inevitably, citizens like ourselves and our children must bear the inconvenience of withdrawal of services. But public opinion can cut both ways. Early informal polls revealed that over 85% of the public may be siding with the teachers and less than 9% supporting the government. 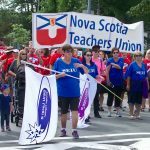 Two organizations, Students for Teachers and Nova Scotia Parents for Teachers (the latter with nearly 20,000 members in its Facebook group) have been solidified support for the teachers. In British Columbia, teachers went on strike three times in a decade (one of them illegal) and parent support was strong. Canadians and Nova Scotians are clearly fed up with austerity politics and the erosion of our public services and realize that the right to strike is an essential part of living in a democratic society. • Democratic, non-sectarian and pluralist politics. • Actively opposing all threats to the sustainability and health of our natural environment. • Creating a culture of solidarity.